In college I transformed the cancellation of my summer internship into a solo cycling trip across the United States (funded via credit card debt). That 4,500 mile journey was captured in the Bike Blog. 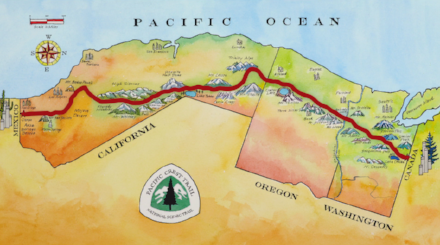 And years later, four years into my career as a Civil Engineer, lacking contentment with my then circumstance and armed with the memory of past adventure, I quit my job to walk 2,650 miles from the U.S. border of Mexico to the U.S. border of Canada via the Pacific Crest Trail (PCT). Funded by the car I sold when I got to San Diego (and more credit cards), those six (6) unforgettable months are covered in the Hike Blog. The Van Blog that followed was born out of my PCT experience, which I can distill to a single word, “prioritizing”. I want to live in such a way that each day counts towards a specific quantifiable goal of my choosing. Finishing the PCT with no money, I needed to choose a goal that required no money to start. Naturally, I decided to become a one-millionaire, assets minus liabilities, by my 30th birthday. My best guess for how to actually achieve the goal was to create a business. With no place in particular to start, the chosen industry defaulted to my most marketable skill, engineering. To give myself the best chance I sought to reduce my life’s operating expenses to something that could be sustained working just about any job. 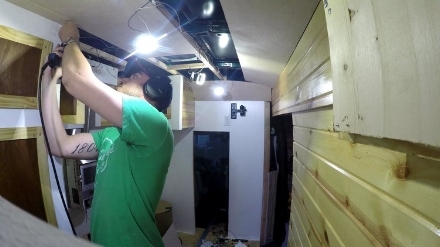 That’s where the van comes in, a house/car/office in a single monthly payment that’s less than median rent in most cities, and has the ability to chase down a business opportunity in whatever city may pick up. The House Blog is not my million-dollar business. Trying to first save money as a Mercedes-Benz car salesman, and then later an engineering salesman in mostly educational market construction, I realized there was simply not enough time to save the money I needed to pursue my own goal by my own deadline. Dates drive decisions. That’s why every goal needs a deadline. To earn a million dollars by age 30 requires different actions than age 40, or 50, and so on. Rather than give up I simply got more resourceful. Traditional business loans, for a presently non existent engineering business, were not an option. Instead I looked to real estate to create my own business loan because lenders historically have extended lines of credit on equity held in property. After surveying the regional real estate market for six (6) months, I won my first rental property on my fourth foreclosure auction. I consider this to be a 1 in 100 find. How did I purchase this property? Prior to searching for any property, I established the financial criteria necessary for other people to give me their cash to sustainably fund the real-estate venture and position myself to fund my future business pursuit. What I was financially able to personally guarantee was ~$250/month in return on deposited equity. This quantity at a rate of 6% has a holding value of $50,000. This rate of return is simply a market competitive guaranteed return. In different financial market conditions I would have to offer more or less. I then back calculated the scenarios in which I could buy a house, renovate it, and have the rent cover all owning and operating costs as well as the return on equity to the investor. This was hard to find. I say 1 in 100 because of the top 100 opportunities I pursued this year I feel this was the best, and one of only a few that would meet my criteria. The House Blog covers my 2018 summer adventure in which I bought a foreclosed property in June for $38,000, completed $17,000 in renovations, and had the property rented by September for $850/month. I’ll leave the blog open ended for whatever may follow, but part one begins with finding the right house in the first place.